My great-grandfather was a mosaic artist from northern Italy, and my dad built me my first workbench when I was five years old. So, it seems that I inherited a love for fine art and craft through both nature and nurture. The greatest influence on my early life, however, was growing up in rural Japan in the late 1950s, inundated with beauty and living within walking distance of the ancient Kintaikyo Bridge. I constantly followed Japanese craftsmen around our home when they were working and was fascinated by their tools and their amazing concentration. I witnessed every step of the building of our family boat. On visits to ancient temples or Samurai fortresses, I was mesmerized by the architecture and decoration. 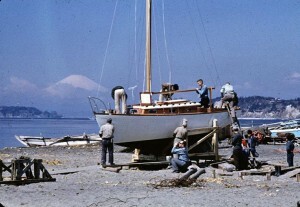 Shiranami (White Wave), our family boat, about to be launched with Mount Fuji in the background. It is customary for a Japanese artist to choose an “art name”; I have chosen Shiranami for mine. The Kanji characters comprise my logo. 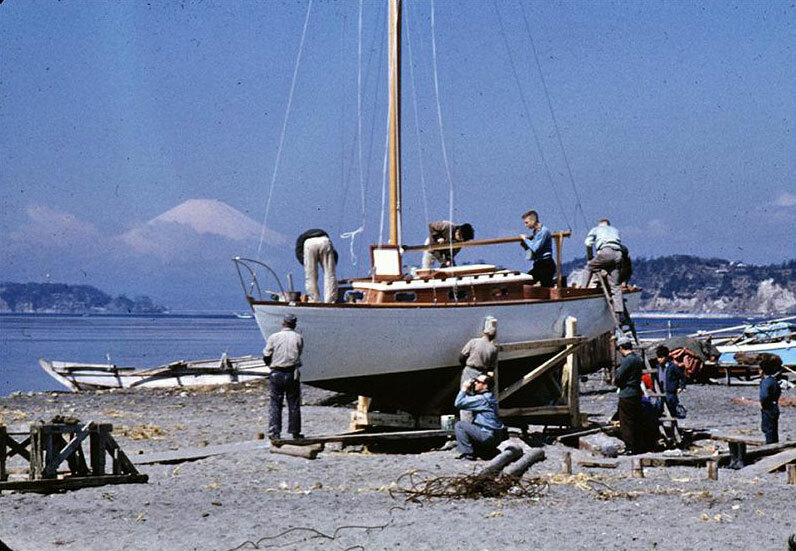 I was always building things as a kid and even worked as a carpenter’s apprentice in a boat-building yard while in high school. I also helped my dad in the restoration of airplanes for the Smithsonian and the Naval Aviation Museum in Pensacola, FL. Despite all these early influences in craft, I ended up studying music in college and then spent 25 years singing opera internationally. One unexpected perquisite of that career was an impromptu education in world architecture, art and design. I made my solo debut at Carnegie Hall in 2000, and, as I was ready to make a career change, it seemed a suitable occasion with which to end my time in the music business. That’s when I began my career in the decorative arts. I began taking in antique furniture for restoration, which eventually morphed into furniture design-and-build. To refine my skills as a designer, I attended Parsons School of Design and The Institute of Classical Architecture. My purchase of a lathe a few years later unleashed a desire to make pieces inspired by my childhood in Japan. I was encouraged to enter my work in fine craft shows and was delighted when my first acceptance was to the Philadelphia Museum of Art Craft Show in 2011. The first piece I sold was to Albert LeCoff of the Center for Art in Wood, and it seems that a benevolent volcano of acceptance has been flowing ever since. In a time when “how quickly?” and “how inexpensively?” are the first questions on the lips of many, I take as my influence the simple beauty and care in workmanship and artistry I saw as a child in rural Japan. In my 25 years as a classical singer, I often found the “business” of music to be ugly, but the music itself always beautiful. I strive to bring the same elements I loved in music – lyricism, harmony and rhythm – to my art now. I work in a broad range of materials and techniques, which I believe to be an asset, as one skill informs another, and the cross-pollination of media can lead to exciting and wonderful results. Whatever the project at hand, regardless of its medium or the historical period or country that inspired it, I embrace every opportunity to create beauty.